Portrait Studio Come paint or draw with us!!! Portrait Studios are a benefit of PAOA (Portrait Artists Of Arizona) membership and there is no additional cost for the model. 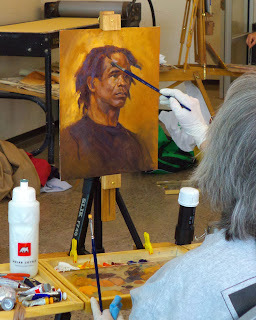 Portrait Studios are a great way to get to know other members, observe, and improve your portrait skills by working from life! It is also an opportunity for non-members to "check us out" before joining. Members may invite artist friends to drop in and observe and find out more about our organization. John was our model and he was fantastic and very professional. 2013 - Portrait Studios Upcoming - MAY, JULY, AND AUGUST!